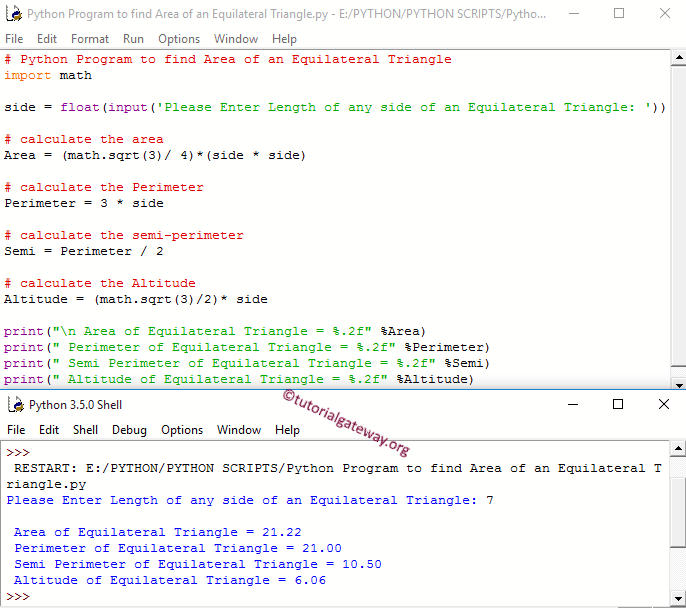 In this article we will show you, How to write Python Program to find Area of an Equilateral Triangle, Perimeter, Semi Perimeter and Altitude of a Equilateral Triangle with example. Before we step into practical example, Let see the definitions and formulas behind the Area of an Equilateral Triangle. The Equilateral Triangle is a triangle with all sides are equal and all of the angles are equal to 60 degrees. If we know the side of an Equilateral Triangle then, we can calculate the area of an Equilateral Triangle using below formula. We can calculate Semi Perimeter of an Equilateral Triangle using the formula: 3s/2 or we can simply say Perimeter/2. This python program allows the user to enter length of any one side of an Equilateral Triangle. Using this value we will calculate the Area, Perimeter, Semi Perimeter and Altitude of an Equilateral Triangle. Following statement will allow the User to enter the length of any side in the Equilateral Triangle. In the next line, We are calculating the semi perimeter of an Equilateral Triangle using the following formula. We can also find semi perimeter using the standard formula = (3 * side) / 2. This program allows the user to enter length of any one side of an Equilateral Triangle. We will pass that value to the function arguments to calculate the area of an equilateral triangle. First, We defined the function with one argument using def keyword. It means, User will enter any one side of an equilateral triangle. Next, We are Calculating the an equilateral triangle as we described in our first example.